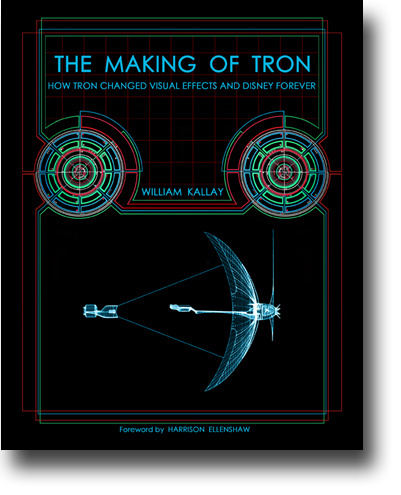 New Book: "The Making of Tron"
In 1982, Walt Disney Productions was in serious trouble. Its films were no longer drawing audiences into theaters. In the era of “Star Wars” and “Raiders of the Lost Ark”, Disney desperately needed to reinvent itself. Disney found its salvation in a radical new film called "Tron". Led by a fearless first-time feature film director, the cast and crew of "Tron" turned the Disney studio upside down and forced it into the modern film age. "The Making of Tron: How Tron Changed Visual Effects and Disney Forever" traces the making of this groundbreaking computer driven film from its inception, through its setbacks and in-fighting, to its enormous influence on modern culture. "Tron" was so innovative, it would change how audiences saw movies and it would forever transform the film industry. Featuring exclusive interviews with Jeff Bridges, Cindy Morgan, Steven Lisberger, Donald Kushner, Harrison Ellenshaw, Richard Taylor, and "Tron" alumni, "The Making of Tron: How Tron Changed Visual Effects and Disney Forever" will blow away your perception of one of the most innovative films of all time. He is a former contributing editor to Widescreen Review magazine and writer for Go, the official magazine for AirTran Airways. Kallay lives in Southern California.